Chelsea Classical Studio brings you a line of safer, natural varnishes for your fine oil paintings. No harsh chemicals are used in their production — no petroleum, no turpentine, and no dangerous fumes. Made with Lavender Spike Oil Essence, they have a distinctive lavender scent. 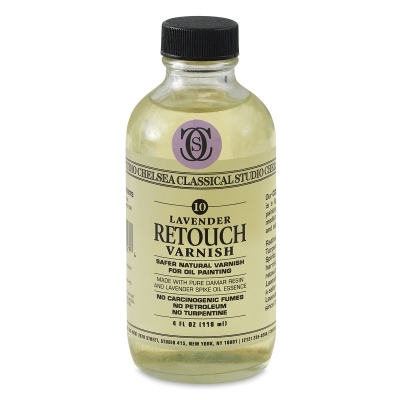 Lavender Retouch Varnish offers superior, classic protection for your finest oil works without any harsh, dangerous fumes. Made with pure damar resin and CCS Lavender Spike Oil Essence, this varnish allows for both protection and breathability. ™ Chelsea Classical Studio is a trademark.